EMI have a 'Debut' series which enables new artists to experience the recording facilities in the Abbey Road Studios. Thus we have this disc of music for guitar by Dario Rossetti-Bonell who states "In this CD I have tried to capture the European and Latin American sounds with which the guitar is most typically associated". There is no doubt that the guitar works of Heitor Villa-Lobos (1887-1959) are probably some of the most recorded of any South American composer, no self respecting professional guitarist would miss having the 'Five Preludes' in his or her repertoire. Likewise aspiring amateurs love to try their hand at these popular works. So here we have Dario Rossetti-Bonell's interpretations of them and a very relaxed view it is too, at 21.23 minutes (against Julian Bream's 19.08 minutes) and that with omitting the repeat of 'Prelude No. 3' the longest of the set. I would have thought that given that this Prelude is a homage to Bach, Villa-Lobos' intention that it be played in binary form must be considered 'obligato'. There was a suggestion that Villa-Lobos had written a sixth very brilliant Prelude which was lost, I presume this is the reason that Rossetti-Bonell has elected to change the playing order to No's 1, 3, 5, 4, 2, so that 'Prelude No. 2' in E major finishes the cycle, giving it a more satisfactory conclusion, (Bream also does this, but his playing order is No's 1, 5, 3, 4, 2). Since John Williams' 1977 recordings of Agustine Barrios (1885-1944) a number of these pieces seem to now be essential in every guitarist repertoire. The four pieces chosen by Rossetti-Bonell are well known and although very attractive I do wonder why more guitarists do not explore the lesser played works of this prolific guitar composer. Again Rossetti-Bonell plays Barrios at a slower tempi than generally accepted, which does have the effect of highlighting the details. But I do think a little more forward motion could have been employed. Antonio Vivaldi (1678-1741) 'Concerto in D' for mandolin, strings and harpsichord could be considered more of an adaptation than a transcription as Rossetti-Bonell plays it as a guitar solo. (I am aware that Liszt played transcriptions of Beethoven Symphonies as piano solos but I don't know if this type of thing, orchestral works being reduced to a single instrument, is entirely satisfactory, the original always being the benchmark). However, this transcription by Rossetti-Bonell is an unusual and interesting item on the disc. Guitar transcriptions of piano works on the other hand prove to be most successful, especially those of the Spanish composers Isaac Albeniz (1860-1909) and Enrique Granados (1867-1916). The evocative flavour of this music is carried effortlessly by the guitar, probably the most Spanish of instruments (the technical requirements are another issue) and Dario Rossetti-Bonell seems most at home in this environment. The 'Valse Poéticos' of Granados being the best moments of the disc. 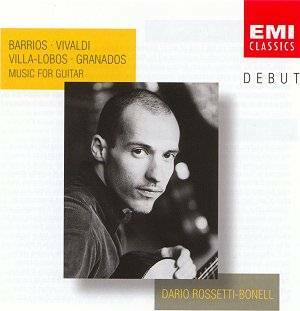 Overall Dario Rossetti-Bonell is a solid player, his preferences for slower tempi throughout does draw out the proceedings a little too much, although in the sections marked 'vivo' of the Granados he does show he is capable of playing quickly. The recording is marred slightly by intrusive finger squeaks (the Villa-Lobos 'Preludes No's 2 and 4 being notorious for this) something more and more players are striving to keep to a minimum, but on the whole a good offering from Dario Rossetti-Bonell, but nothing really new. It is of course impossible to know whether artist or record company consider that they have, with their 'Debut' series achieved what they set out to do presenting this kind of programme in an already competitive market.